Cucurbit downy mildew was confirmed in a 10 acre cucumber field near Rosenhayn in southern New Jersey today. 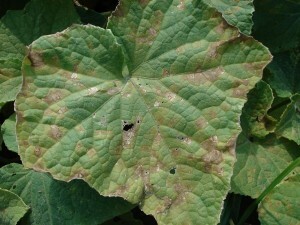 This is the first report of cucurbit downy mildew in New Jersey this growing season. All commercial cucurbit growers in the state and region should scout their fields on a regular basis. Growers who have not already included downy mildew specific fungicides into their weekly fungicide programs should do so immediately. If left uncontrolled, cucurbit downy mildew will cause significant losses. For more information on controlling cucurbit downy mildew please see the 2014 Commercial Fungicide Recommendations Guide. Organic growers can apply copper and other OMRI-labeled products at labeled rates to help suppress downy mildew development under light disease pressure.